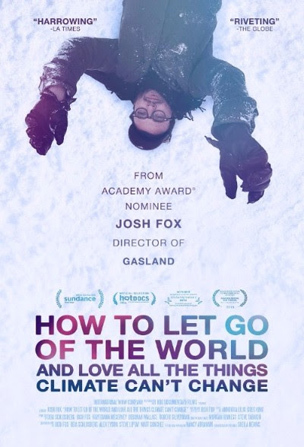 Just as Josh Fox, the Oscar nominated director of GASLAND, was doing a happy dance because his home was no longer threatened by fracing, he discovered that the effects of climate change were killing the trees around him. Setting out to see what could be done he discovered that some effects may not not be reversible. He then decided to travel the world to see what the situations are in various countries and to see what we won't loose to climate change. Full disclosure I am not a Josh Fox fan. I have not reviewed his GASLAND films here at Unseen Films because I really don't like them or him. I'm not pro- fracing nor am I anti-climate change I just think that his films preach too much. And so it is with HOW TO LET GO OF THE WORLD, great opening dance number aside, I still felt like I was being preached to. Don't get me wrong the trip that Fox takes around the world is enjoyable and I really do like the film, I just can't get past that the film is first and foremost a lesson, which is odd because Fox seems to be trying to do more than just scream about gloom and doom, he's actually trying to show the good things that have come out of being forced to change how we do things. As this posts, the day before the film premiere on HBO I should probably say that this review has been sitting in the queue waiting to be posted for about three months. I saw the film sometime about the film hit theaters but I was too busy with other things to get a finished review up. It sat in my pile as I watched several other climate change films that came and went. This was the first of many films on climate change that I saw this year and I decided to go back and take a look at the film to get my thoughts clear on the film- especially since so many similar films were so blah that I didn't review them. Seeing it a second time I noticed a couple of things. First it is much better than the films that I didn't review. While I would still say that TIME FOR CHANGE is the best of the climate change bunch HOW I LET GO... is a nice change of pace that tries to do something more than just throw out the facts. Fox tries to do more, he's trying to show us the ability of the human spirit to survive and he does so very well. Its so nice to see a somewhat hopeful film.